Banjara embroidery is made using very fine hand work that involves patchwork, Banjara mirror work and appliqué work. The origins of Banjara embroidery are rooted in the culture of a semi-nomadic community known as the Banjara. The Banjara, also known as Lamani, Lambani, and Banjara Lambani, are a class of semi-nomadic people from the Indian state of Rajasthan. They have descended from Rajasthani Rajputs and are also known as Lakha Banjara. Together with the Domba, they are often referred to as the “gypsies of India”. The Banjara are mostly known for their colored dresses, their folk ornaments and bangles and, of course, their Banjara embroidery. Banjara embroidery is a specialty of women from this tribe who do Banjara tribal embroidery mirror work on clothes by attaching glass pieces on them. In earlier days, women of the Banjara community used to only wear clothes that had heavy Banjara embroidery. Banjara work usually involves a variety of stitches such as chain stitch, herringbone stitch, cross stitch and chevron stitch. When paired with exquisite mirror work, these stitches create the basic foundation of Banjara work. While embellishments made of silver and gold were used in the earlier days, nowadays fancy artificial embellishments are commonly used. One more key feature of Banjara embroidery is the usage of cowry shells. Along with mirror work and path work, cowry shells are a unique aspect of Banjara work. Colorful threads are mostly used in the embroidery that reflects the vibrant life style of Banjara people. Basically, Banjara embroidery is a very colorful form of embroidery that combines mirror work, path work, cowry shells and embellishments. The sunlight that gets reflected through the mirror showcases the beauty of this type of embroidery. The mirrors, in particular, are extensively used in Banjara work and are perhaps its most distinctive feature. 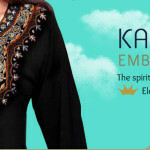 The embroidery is mostly done of a cloth that is a shade of blue or brown. This is done so that the color contrast is easily noticed and the embroidery comes out more beautifully. Quilting stitches are used at times in patterning along with cotton threads to create unique and unusual geometric patterns. Banjara embroidery is incorporated in a variety of modern garments as well as the traditional attires and fabrics. A Banjara bag is a popular product that is made using Banjara embroidery. 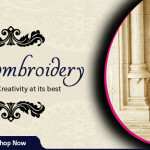 Other such products include Banjara purses, Banjara belts, Banjara dresses, Banjara cushion and pillow covers, Banjara salwar suits, Banjara skirts and Banjara blouses. 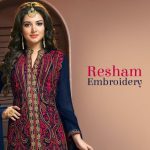 Banjara embroidery designs in dresses and bags are creating a rage these days. Dresses and bags with Banjara embroidery motifs will go a long way in helping someone make a style statement. Especially in the summers, the bright colors help make a favorable and positive impression. The glass work and intricate Banjara work designs create a vibrant, ethnic aesthetic which is both trendy and attractive. By using a Banjara bag and paring it up with contemporary clothing, women as well as men can create a cool fusion vibe. 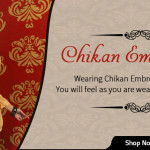 At the same time, it can also be used to complement traditional clothing. 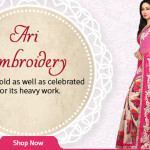 This versatility is one of the best features of Banjara work. 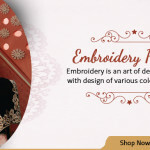 Banjara embroidery has become a trend that has, in recent years, caught the fancy of many international brands and labels and as such has become a must-have embroidery style for ethnic loving fashionistas. As Banjara work involves intricate glass work, patch work and appliqué work, it is advisable to pair it up with contrasting outfits to make a great overall impression. For example, women can pair up Banjara bags sporting heavy Banjara embroidery with contemporary and modern clothing such as tunics and leggings in plain colors. Finding a Banjara dress online and later pairing it up with pastel heels is going to create a wonderful contrast. One can also pair up a Banjara skirt with a pastel or plain colored tunic to help create a mash up of folksy and contemporary clothing. Clothing with Banjara embroidery also goes wonderfully well with brightly colored accessories such as funky footwear with laced mirror work. Finally, Banjara bags can be matched with heavy jewelry that will blend in wonderfully with the overall outfit. Jewelry such as oxidized chunky silver, mirror work necklaces, gold and dangling earrings, colorful bangles and beaded chains will all go wonderfully with bags or dresses that have heavy Banjara work done. In short, by opting for Banjara embroidery, it becomes easy to blend traditional and modern clothing.